The leg is getting smaller!! So back to my appointment and measurements which have reduced since my visit in March 2014. One of the measurements that is used is the L-Dex reading. http://international.l-dex.com/what-is-l-dex/ This compares the good and bad leg and shows how much fluid is present in the LE leg in comparison to the good leg. In March my reading was 7.1 then June 5.1 and now it is down to 4.5 which is within normal range. This is very exciting as there seems to be a gradual improvement each visit. The doctor also felt the area at the back of my lower thigh had softened a lot, with the help of three weeks compression bandaging, MLD and Compression Garments. I have also had no infections since the surgery 18 months ago so that is a huge plus for me. I am back in a pool without fear if infection which I am very happy about. If this surgery keeps my leg in the best state possible then that is a big improvement, as my fear was always that it could get worse and worse. I have not been writing so many updates on my own progress as there has been little to say!!! It is a slow and steady reduction which takes lots of patience!! Will I ever not wear compression?? Only time will tell… Next appointment will be March 2015, my two-year anniversary. I will be having an MRI and Ultrasound done then but I declined another Lymphasyntagraph!! No more injections between toes needed!! One if the fears associated with Lymph node Transfer is that patients may get Lymphoedema in the area of donor site. This research is interesting in addressing that problem for the future, by using techniques to map the lymphatics of the donor site and ensuring no nodes are removed which drain a limb. Thanks to my “Reasearch Assistant” in Belgium who keeps me up to date with the latest articles. I am sure we will see more of this work from Dr Dayan in New York. Erez Dayan, M.D., Mark L. Smith, M.D., Mark Sultan, M.D., William Samson, M.D., Joseph H. Dayan, M.D..
Beth Israel Medical Center, New York, NY, USA. Vascularized groin lymph node transfer has been described as a successful treatment for lymphedema. However, patients with bilateral lower extremity lymphedema may not be candidates, and the short pedicle may not be ideal if the recipient site requires greater pedicle length. Transfer of axillary lymph nodes draining the chest wall has been performed but there is no literature on the technical details of this procedure. We present a case series and technique for vascularized axillary lymph node transfer using reverse lymphatic mapping to minimize the risk of lymphedema in the upper extremity. Four patients underwent axillary lymph node transfer between October 2011 and June 2012: two patients with lower extremity lymphedema and 2 with upper extremity lymphedema. Reverse lymphatic mapping using technetium injection into the upper extremity and indocyanine green into the chest wall was used to avoid harvesting lymph nodes draining the upper limb and to facilitate chest wall lymph node harvest. Donor lymph nodes were harvested based on the thoracodorsal artery in 2 cases and based on both the thoracodorsal and lateral thoracic arteries in the remaining 2 cases. A thoracodorsal artery perforator skin paddle was included in 3 of the 4 cases. Intravenous indocyanine green and SPY evaluation was used to confirm perfusion of lymph nodes following anastomosis. Video and technical details will be illustrated. All patients had viable free flap transfers with satisfactory perfusion of the lymph nodes confirmed by intraoperative SPY evaluation. There were no postoperative complications and no observed lymphedema in the limb adjacent to the lymph node harvest donor site. Our first patient experienced a significant reduction in upper extremity limb volume as illustrated in the attached figures. Long-term follow-up on volumetric data and quality of life will be provided at the time of the meeting with a follow-up range of 7 – 15 months. Axillary lymph node transfer may be a useful alternative to groin lymph nodes and provides a long pedicle which may be preferable in a severely radiated or hostile recipient environment. I am sharing with you the wonderful work of the Lymphatic Reasearch Foundation… They are at the forefront of Reasearch in treating lymphatic diseases.. Please give them your support as they are helping us to find the answers we need…. We were thrilled to see this video produced by the Long Island Imagine Awards this week. It was shot as a result of LRF being named a Rising Star Finalist for this year’s awards. We hope the video serves to introduce many more people to LRF’s mission and will get more people involved in supporting our work. We ask all our supporters to share the video. We also released a video interview with Elizabeth Basaca whose daughter Naomi has lymphatic malformation. Many people have asked how Naomi is doing. We are pleased to report that she is doing well, and have asked Elizabeth to give us a more complete update. Stay tuned. Our Marathon team is complete and our teams will now begin fundraising. Some of them have started already. Please consider making a donation to LRF through this exciting event. Posted on June 14, 2013 by helensamia under Health, Other things! Rosemary D. White spent many years working at Mt Wilga hospital that has a specialist Lymphoedema clinic. It is here that I had five weeks of treatment when I was first diagnosed and again in 2009 after an infection. Mt Wilga, under the care of Dr Helen Mackie, has always been at the forefront of treatment even when no one else was helping. However Rosemary found that there were cases that did not respond to MLD, or if they did it did not last for long, she made it her life’s work to find better ways of treating Lymphoedema. Rosemary wanted to stimulate the deeper Lymphatics that remained untouched by MLD which would enhance the benefits of treatment. Rosemary looked at all types of alternative therapies to find an answer and found that the use of Crystal Quartz could help with decongesting the Lymphatics in conjunction with magnetised water. Rosemary went on later to teach at Nature care and was Education Officer for the Australian Deep Lymphatic Therapists Association. When Rosemary died, in her 70’s, she had taught her treatment to a handful of therapists who continued her work. She did not live long enough to see it tested scientifically but there have certainly been some beneficial results. Yesterday I went to see Shan, at Shan Therapy, a pupil who has continued Rosemary’s work. This is the story of my treatment which was very unusual but totally amazing. I have no idea how or why it works so I will just describe my experience. Shan told me that about half an hour before my appointment I should eat some protein, on arrival I was given a herbal tea made of lemon, ginger and dandelion, which is good for the lymphatics. The massage table had a layer of bags filled with water that had been magnetically charged. I also had bags of magnetised water placed under my neck and around my head!! I think I was glad no one was there to take a photo as I think I looked like a large baby all wrapped up with a bonnet on!! Next Crystal quartz pieces were taped to all the main Lymph node areas from head to toe. Shan then used a piece of quartz instead of using her hands to work on the various areas of the body, clearing one section at a time. Stimulating the nodes via the crystal which sends a piezoelectric effect to stimulate the deeper nodes. The first area cleared was the left quadrant, asked to lift my arm it felt lighter than my right arm, then left leg and then right and finally the right arm… Each time testing how the limb felt against the untreated one. At times Shan said my face lost all its colour so in between I was given drinks of water, aromatherapy to inhale and breathing exercises. This whole cycle of treatment continued until all limbs felt light, I was there for two hours in total. I told you it was different and I cannot really describe it properly. I did get the typical detox headache after and went to the loo quite a lot, as fluid left the body. However today I feel good, my body feels less congested and lighter. Three treatments are suggested so I will see what the final outcome will be. It certainly did me no harm and Rosmary spent years working on this, creating a treatment that she felt stimulated the Deep Lymphatics rather than just the surface ones that Manual Lymph Drainage works on. These are two articles written by Rosmary that explain the treatment in a more scientific way. Those of you who are therapist may have used this method or heard of it. I would love to hear your experiences. Posted on June 9, 2013 by helensamia under Health, Other things! Sorry if you get squeamish but this picture was too good to miss as we can see a real Lymph node and Lymphatic Vessel ….http://www.lymphovenous-canada.ca/research.htm. 1997. Reading this research we have actually come a long way since 1997…. and we have further to go… It is amazing to think that the little pearly looking node has the ability to grow new lymphatic vessels and find new pathways in the body!! 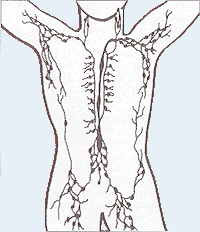 This is a great description of how the Lymphatics work and the cause of Lymphoedema. Leslie uses some great comparisons to garbage trucks!!! Thanks to the Breastcanceryogablog and Leslie Ronson Brown. I am sure you will all enjoy this post… You will find other great articles also in this blog…thanks..
Good heavens! It’s hard to understand this disease called lymphedema that some of us get…and some of us don’t…as a side effect of cancer treatment when lymph nodes are removed followed by radiation. We might be given a pamphlet to read about it, but that is usually at a time when we are struggling with much confusion and fear. I saw a link to the following article on Facebook today and thought it would be good to share. This is another example of the latest surgical techniques being used to combat secondary Lymphoedema. Lymphoedema — painful swelling in the limbs — is a common side-effect of treatment for breast cancer, but also blights the lives of thousands of men with conditions such as prostate cancer. Stuart Elcock, 69, a retired civil servant from Buckinghamshire, underwent a new procedure for tackling it. “In 2011 I found a lump at the top of my right leg,” said Stuart Elcock “When doctors told me I might develop lymphoedema after surgery for a tumour on my thigh, it was the least of my worries: I just wanted to get rid of the cancer.I’d been treated for testicular cancer years ago, but had more than three decades of good health after that. Then, in 2011, I found a lump at the top of my right leg — it was a sarcoma, a rare type of cancer in the connective tissues.The doctors said it might be due to the radiotherapy I had in the Seventies.The surgeons managed to get the sarcoma out. But over the next two months, my right leg swelled until it was about 50 per cent bigger. 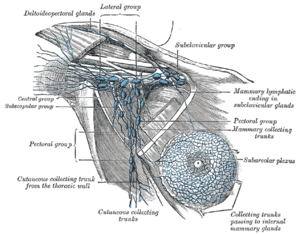 I had lymphoedema, where the lymph system — a network of tiny vessels that drains tissue fluid back to the blood — doesn’t function properly.It was caused when the surgeons removed some of the lymph nodes next to my cancer.The nodes are like filters, and the surgeons took them out to check if the cancer had spread. But if they are damaged or removed, fluid can build up. My leg grew very heavy and I lost the feeling from my groin down to my knee. The skin became hard and my knee and ankle swelled. I struggled to walk short distances and had to stop driving,showering was difficult — I couldn’t wash my feet because my knee was swollen, so my wife, Morag, had to do it. She also had to put on my shoes and socks. Other problems arose, too — the lymph system helps defend against infection, so you can get skin infections.I needed antibiotics for two bouts of cellulitis, infection of the tissue below the skin. I had numerous urinary infections, too. My GP referred me to a lymphoedema clinic, where I was given a compression stocking, but after a few days of wearing it, the 8 inch surgery wound in my thigh opened slightly and lymph fluid started leaking. Even with lighter compression, the wound opened and the fluid soaked on to my boxer shorts.My GP referred me back to the Nuffield Orthopaedic Centre in Oxford, where I’d had my cancer surgery. Dominic Furniss, a plastic surgeon, suggested I try a procedure he had recently learned in Japan, which would redirect the fluid away from the wound. I quickly agreed. “More than 125,000 people in the UK are affected by lymphoedema. It’s very common in women who’ve been treated for breast cancer — about 60 per cent of sufferers whose lymph glands are treated will develop it, but you can get it after many other cancers, too, such as testicular, prostate and melanoma. There are even reports of lymphoedema in the face after radiotherapy for head and neck cancer. For someone like Stuart, who was leaking lymph fluid through his open wound, it can be very distressing. Conventional treatment involves massage, compression and life-long skincare to prevent infections, but this doesn’t address the cause — the blockage to the outflow of lymph fluid. This new technique — supermicrosurgery — rather than trying to force the lymphatic fluid past the blockage, we direct the lymph vessels into the veins so the fluid bypasses the obstruction. The lymphatic vessels and veins we work on are tiny — between 0.2mm and 0.8mm in diameter — so we use a microscope and super-fine instruments. First, we make about four 1in incisions in the affected limb, and find the lymph vessels and veins just underneath the skin. We then take some of the lymph vessels and stitch one end into a vein, using nylon stitches about a fifth of the thickness of a human hair. Studies show the more vessels and veins you join, the more effective it is, so we do between six and ten, depending on time. The operation takes four to six hours. As we only go up to 2cm deep into the tissue, the only real risk with the operation is a superficial wound infection. It leaves scars, but they aren’t very noticeable, and there’s no great risk of damage to deep structures such as nerves and tendons. The real joy about this operation is that it’s minimally invasive, and most patients can have it done under local anaesthetic. When Stuart came to me, he was struggling with daily tasks and his wife said he wasn’t the man he used to be. But when I saw them again a few months ago, she said: ‘You’ve given me my husband back.’ He had normal shoes on and trousers — I’d only seen him in loose-fitting elasticated ones. This technique won’t cure very bad lymphoedema, but we can reduce the complications, make the limb feel softer, and reduce the swelling. The benefits continue accruing for about four years after the operation.We can now identify early stages of lymphoedema and even those patients who are at risk of getting it. For example, if a woman with breast cancer is to have her lymph glands removed from her armpit, we can perform this surgery before the swelling manifests. So many people survive cancer nowadays that we need to look at the complications of their treatment and improve their quality of life. The operation is available on the National Health Service in England and costs about £10,000 when carried out privately. I saw these exercises today on You Tube and thought they would be useful for myself at the moment, also for anyone with Lymphoedema of the legs to help stimulate the Lymphatics of the lower body. Lymph in our bodies travels by the movement of the muscles that squeeze the tissue as they move and push the lymph into the lymphatic vessels helping it to leave the body. In my case I cannot go for a big walk or swim so these exercises will suit my limited abilities at this time. I also felt they are suitable for anyone, as you do not have to be “fit” to be able to do them. All you need is a chair and some time…. No excuses!!!! English: Propulsion of lymph through lymph vessel Français : Propulsion (centripète, vers l’intérieur du corps) de la lymphe (en jaune) dans un vaisseau lymphatique. Chaque cellule valvulée est un lymphangion, qui doté d’une fine enveloppe de fibres musculaires spiralées peut se contracter. Des trains rythmiques de contraction propulsent la lymphe vers les ganglions lymphatiques (Photo credit: Wikipedia) Propulsion (centripetal, inwardly of the body) of the lymph (yellow) into a lymphatic vessel. 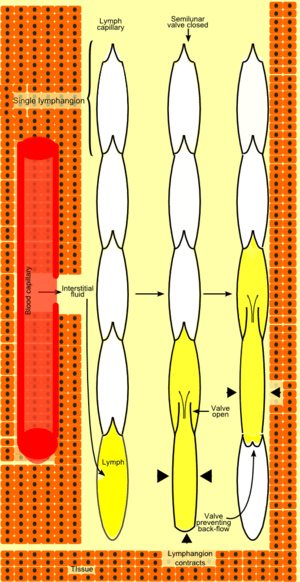 Each cell is a valved lymphangion, which has a thin shell of muscle fibers.